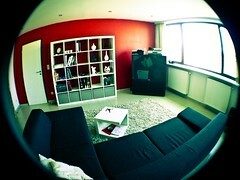 Where I work we sell a package that contains a Nikon 5400/8400 and Nikor FC-E9 Fisheye lens to real estate agents. Cause this is a rather bulky and sometimes unpractical solution, they looked for something new. 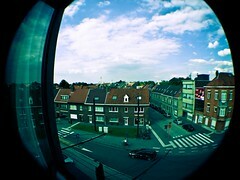 This week a box of 100 “Lomography LC-A Fisheye adaptors” came in… Needless to say I had to test one. While optically not in the same league as their big brothers they really are a lovely & inexpensive solution. I won’t be doing an optical review here, if you want top quality this is not a product for you, but if you want to have some great fun, this is a good bang for your bucks. Ever since I bought my first DSLR I’ve barely been using my new old Casio EX-Z1000, and now I found a new use for it. The back end of the fisheye is magnetic and attaches to the lens front of your small compact camera. If that part is not magnetic (in most cases) they supply a thin metal ring that glues to the front of your lens. If you don’t want to let the fisheye drop when you bump into something, a rubber band that wraps around the lens (and attaches to the cord of your digital camera) is supplied with it. Also included in the package are 4 metal rings , a pouch and a front+back cap for the lens. Because this thing is originally sold for lomo cameras I lomotised some shots in lightroom. 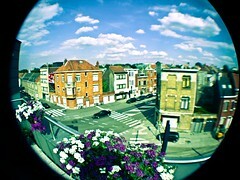 Now I’ve got my digital lomo fisheye camera and surely will have some fun with that. And because most point & shoots can do video there is room for exploring in that direction too (I say no to video on flickr!). More info on this little guy can be found here. hi tom, this is a really interesting post! I’m looking to a get a compact digital camera, but like the idea of adding other lenses to it and have a lomo lca. I’m wondering if you could send me a reply via email on whether or not this fish eye adaptor works with virtually any camera. I’m not too familiar with the optics stuff, so I’m wondering how it worked with your casio and whether you simply put the fish eye on top of your existing lens and you could still zoom in/out. (soulpepper@gmail.com) thanks in advance!